Pressure eases above 18,449 but a close in the Dow below 17,992 would be a clear warning that a steep fall could be underway. The constitutional reform that is voted on in the referendum is part of a package aimed at making the political system more stable and facilitating decision-making. The package includes: (1) the electoral reform (Italicum); and (2) reform of the Senate. The first entered into effect earlier this year (but is currently challenged and awaits a decision by the Constitutional Court), while the Senate reform is being decided on 4 December in a referendum. 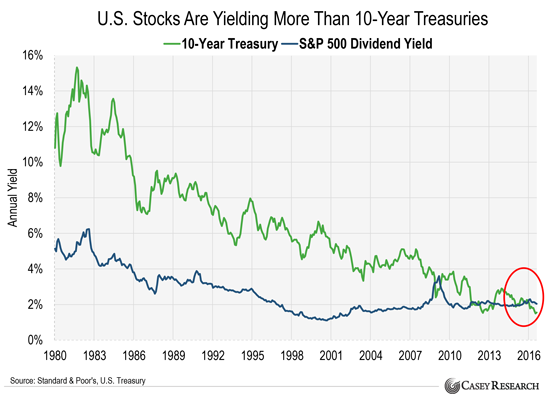 The correlation between bonds and stocks has never been higher. 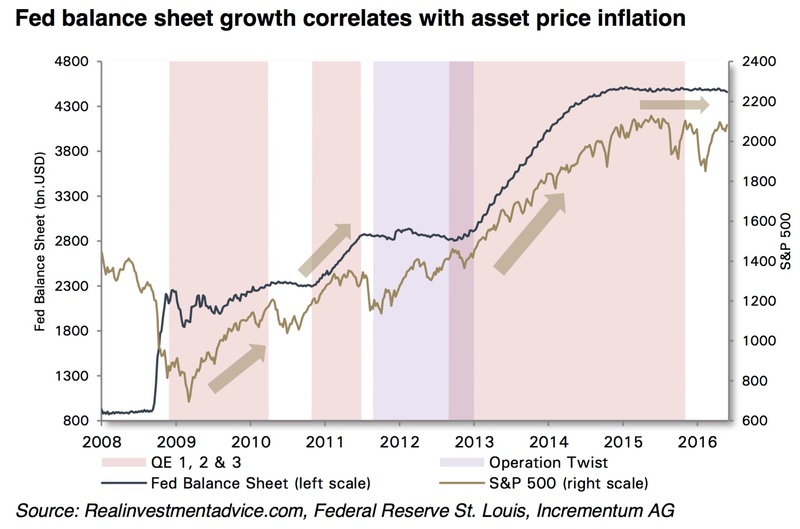 In a 'normal' world, bond prices and stock prices are strongly inversely correlated (red shaded region in lower pane below) but the last few weeks have seen a massive regime shift (in fact the biggest shft in history) as the entire financial market becomes captured by central bank idiocy. The CEO of Deutsche Bank sees no need for state support of his institution.In an interview with "Bild" (Wednesday) John Cryan said aloud advance notification to the question whether the Bank need government aid: "This is not an issue for us." The manager had also jected reports and speculation about alleged talks with German Chancellor Angela Merkel (CDU) on state aid for the German bank. "I have not asked the Chancellor at any time for help. I have indicated like nothing." Cryan said. He could not understand "how someone can say that." Even its shareholders do not want to ask for help of the German Bank CEO. "The question of a capital increase currently does not arise," said the manager.The Bank met all regulatory capital requirements. They have "far fewer risks in the books than in the past" and was "comfortably equipped with free liquidity". The CEO described the situation of Deutsche Bank as better than it was currently perceived from the outside. 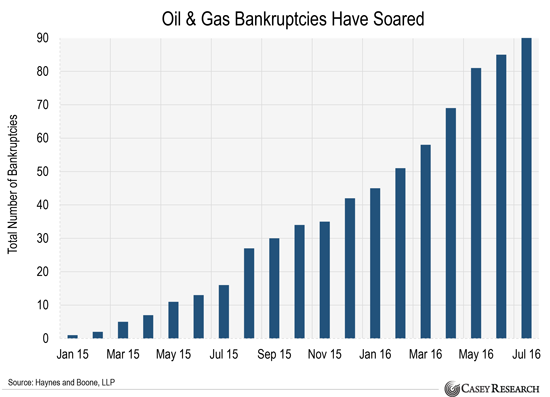 So no capital increase, plenty of liquidity, and fewer risks? Just days after Bloomberg's Consumer Comfort index plunged to its lowest since 2015, The Conference Board reports a spike in Consumer Confidence to 104.1 - the highest since Sept 2007 (right before the market topped out). Right now the market is perceived to be so dangerous that it’s even chased the most fearless value investors to the sidelines. Just this evening, in the Presidential debate, Trump warned that the stock market was a bubble “about to pop”. 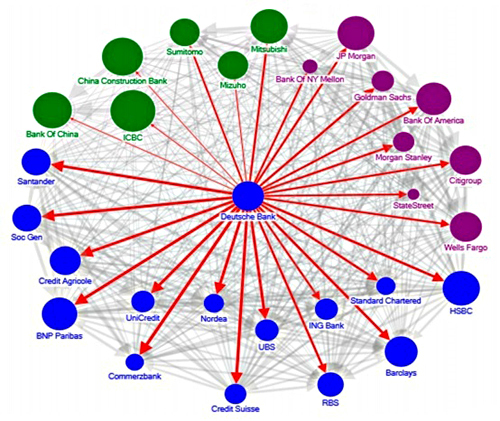 Now, the bearish billionaire circle has grown even wider with the addition of Warren Buffett. The “Oracle of Omaha” as he’s known, currently has more money outside the markets than ever before in his five decades running Berkshire-Hathaway. This week, both the Bank of Japan and the Fed announced their interest rate policies. The BoJ came up with an underpinning of 10-year JGBs at zero yield, and the Fed came up with, well - nothing. Except, the FOMC reckoned long-term real GDP growth was likely to be about two per cent, rather than previous hoped-for rates of three or four per cent. That bit of the FOMC statement didn’t get much publicity, but it represents the Fed throwing in the towel on monetary policy. Japan has no more significant policy tweaks either. So what we are seeing is an admission that interest rates will have to be kept at zero and negative respectively for a prolonged period of time, because neither central bank really knows what else it can do. Gold and silver had begun to rally ahead of the interest rate announcements, and following the Fed’s on Wednesday night, gold jumped 2%, and silver by 4%. Silver in particular has had a good week, with the dollar price rising from a low of $18.78 to a high yesterday (Thursday) of $20.07, up nearly 7%. This morning it had eased to $19.80 in early European trade. Gold rose from a Monday low of $1309.5 to a high of $1343.7 yesterday, a rise of 2.6%. This morning it opened at $1335, after some profit-taking. 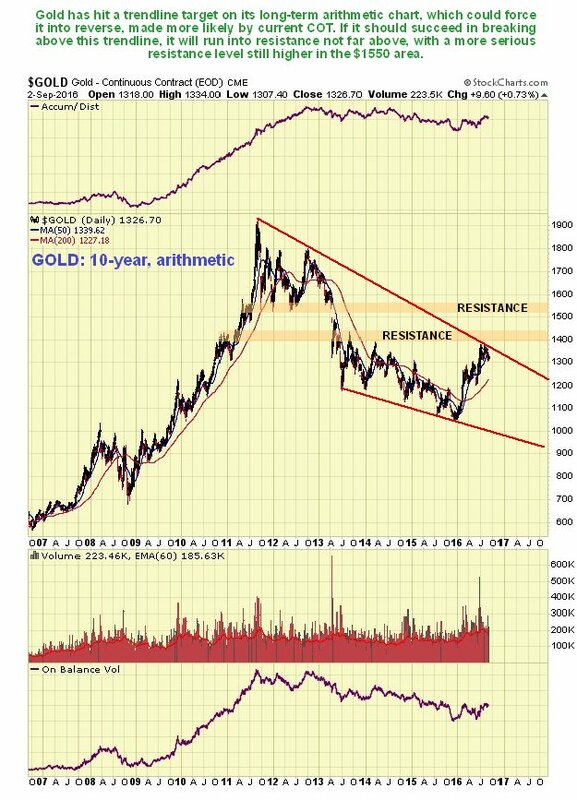 Taking into account the confirmations of continuing weak interest rate policies, there is a good chance that we can say support above $1300 for gold has held, and it is now ready for a challenge of this year’s high at $1370. 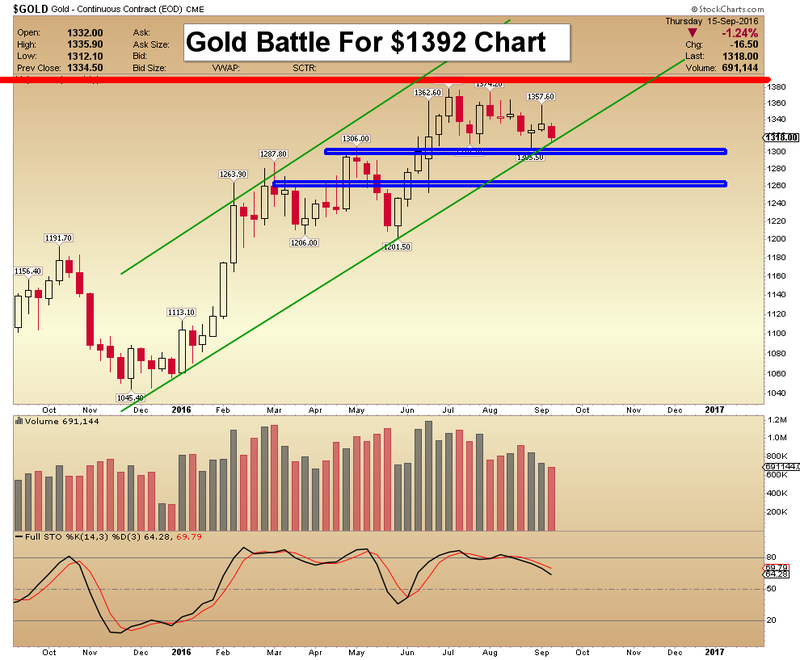 If gold can clear the $1345-50 level, this outlook will be confirmed. 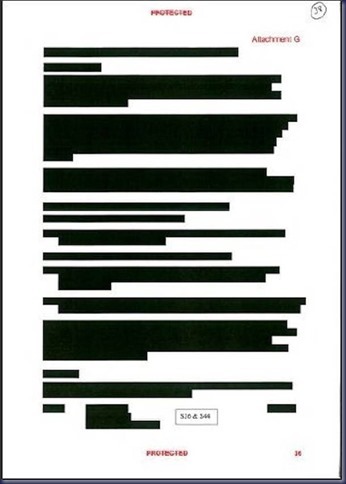 The technical position is shown in our next chart. head of the FOMC meeting, analysts commentary was mixed, with a number of them recommending profit-taking in gold. This reflected the reasonable possibility that support at the $1300 level would not hold, and a move towards $1250, where the 200-day moving average currently resides, was on the cards. This year’s gold performance in other currencies is worth a look, which is our next chart. The differences reflect currency movements as well as gold itself, and there are two things worthy of comment. First, the euro has weakened over the long-term, and if it breaks below $1.10 that could signal a move to challenge parity (it is currently 1.1216). The event that might cause this is deterioration in Italy’s economy, or renewed banking concerns. Secondly, the Japanese yen is poised at the JPY 100 level to the dollar (currently 100.720), which if broken could signal a bout of further strength for the yen. 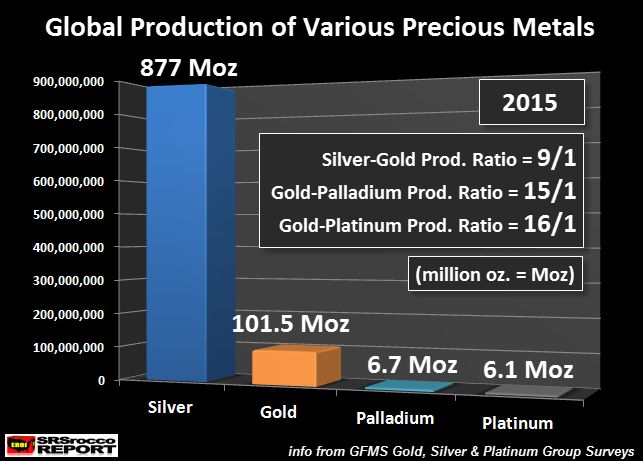 While we will only know these outcomes in retrospect, it is therefore worth allowing for a degree of currency volatility when considering future precious metal prices. 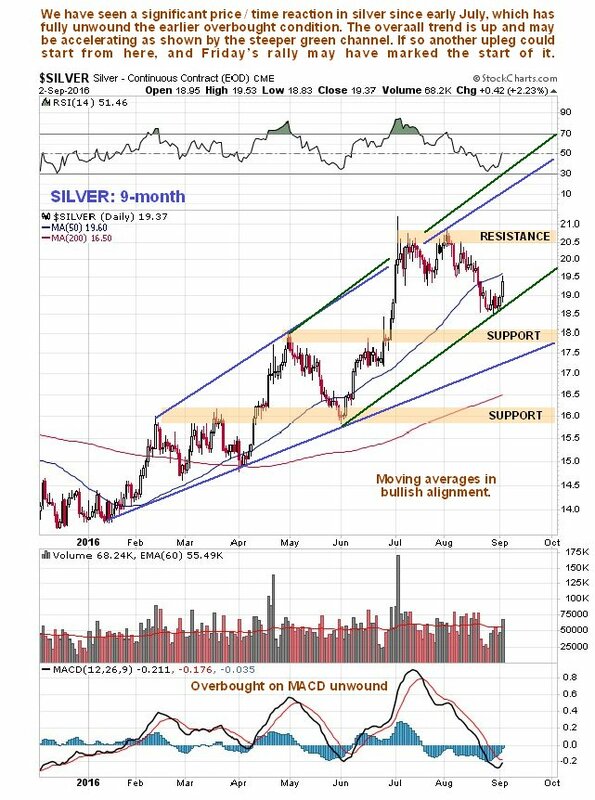 Finally, silver’s outperformance is worthy of a special mention. 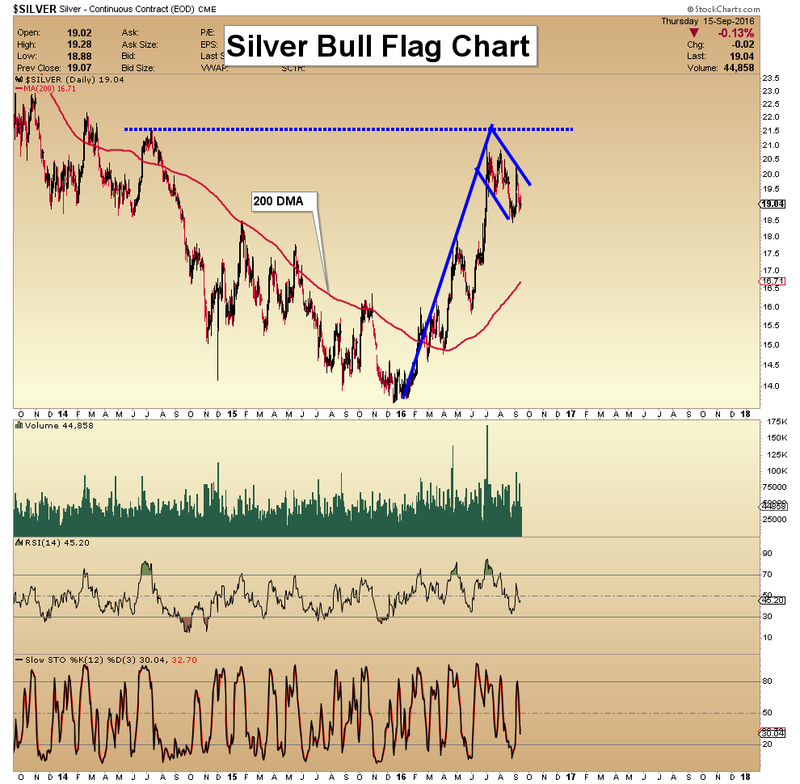 This week, it has been noticeable how silver’s intraday movements have tended to lead the gold price. 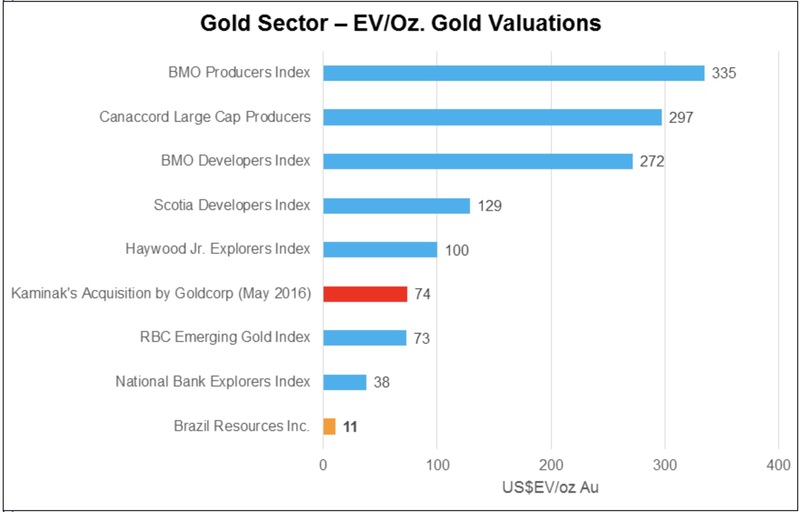 The most likely explanation is that there is a degree of front-running by insiders, sensitive to the larger flows taking place in gold. At the same time, its outperformance during the week suggests a shortage in physical and paper markets, which the bullion houses are reluctant to supply by the creation of yet more contracts. 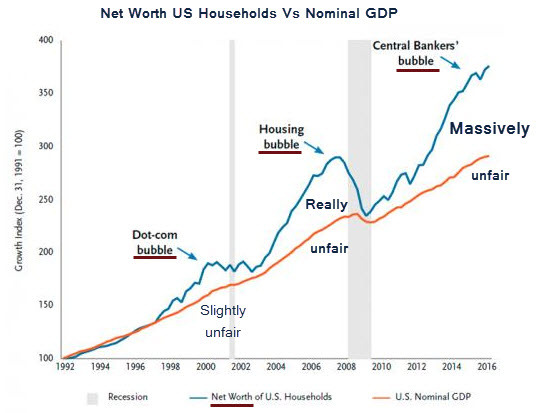 Arbetsmarknaden i USA ser inget vidare ut och FED håller skenet uppe trots ekonomins allt sämre utveckling. When someone gets a “job” that person begins to pay “income tax.” The Government loves this because it funds revenues. Which is why it’s rather off that if employment is indeed rising, income taxes being withheld have FALLEN for the last two years. Either those “jobs” don’t actually pay income… or the “jobs” don’t actually exist. 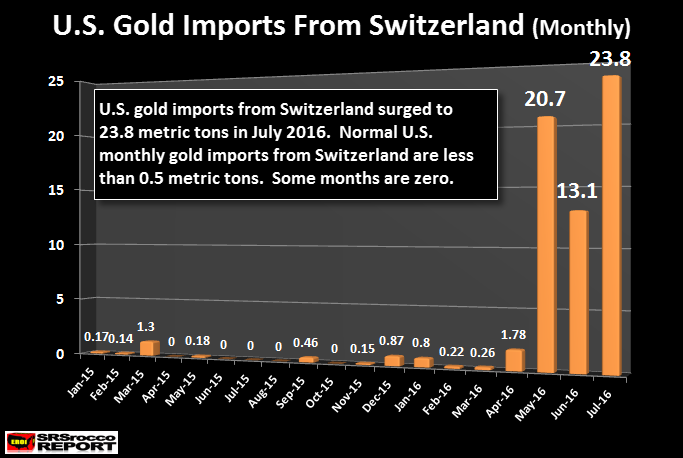 It seems as if the tide has changed as the U.S. imported a record amount of gold from Switzerland in July. 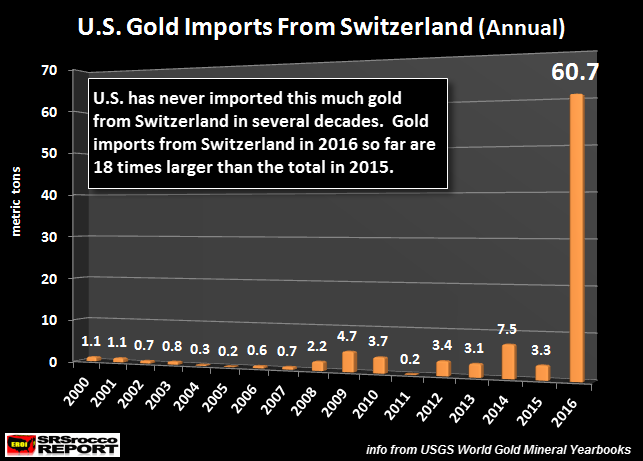 Normally, the flow of gold from the United States has been heading toward Switzerland. 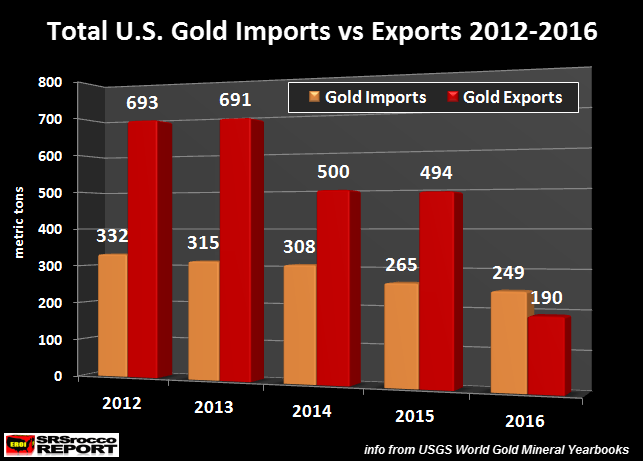 For example, when the U.S. exported a record 691 metric tons (mt) of gold in 2013, Switzerland received 284 mt, which accounted for 41% of the total. 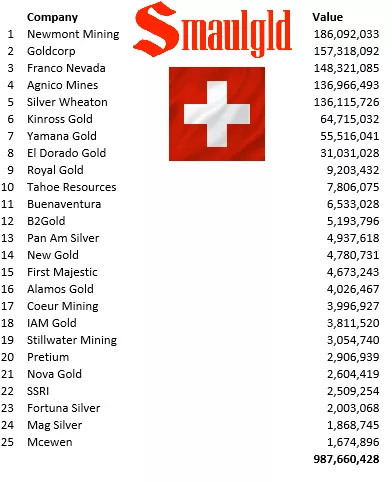 Compare that to the paltry 3 metric tons of gold imported from Switzerland that very same year. 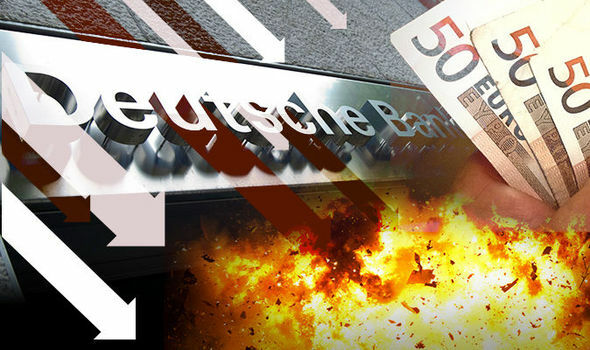 The €42 trillion (notional) derivatives mess known as Deutsche Bank remains under severe pressure. Its market cap is $17 billion. It has no earnings and pays no dividend. The median price-to-sales ratio for the S&P 500 has never been higher than it is today. 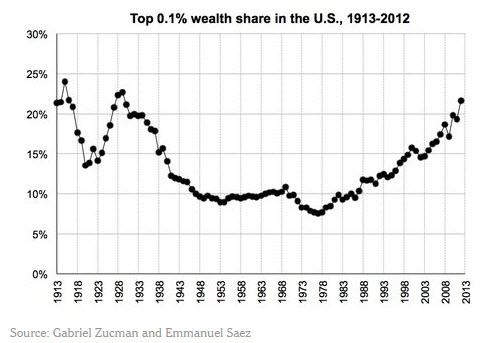 Indeed, it’s never been anywhere near this high. 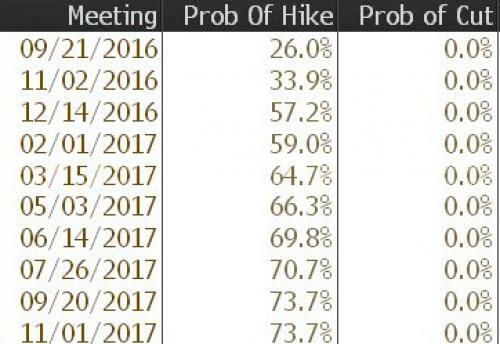 As a result of the revised dot plot, the Fed now sees one rate hike in 2016, supposedly in December and only two rate hikes next year, down from their June median projection of three. Also as r-star continues to plauge the Fed, the long-run interest rate is now seen at 2.875%, down from 3.0% three months ago. FED avvaktar som vanligt samtidigt som ekonomin tappar momentum. Är det någon som tror att FED vet vad dom håller på med. Huspriser/Löneintäkter för några väl valda övervärderade städer i världen. Notera Stockholm i detta celebra sällskap. to new research by economic consultancy firm Longview Economics: the firm found that only San Jose in the Silicon Valley is more expensive than Shenzhen. The Chinese city has seen prices rise 76% since the start of 2015, with the acceleration beginning in April 2015 as the country's stock market was nearing its peak. The situation in Beijing and Shanghai is similar, albeit less extreme, the company states. According to Watling, the typical home in Shenzhen costs approximately $800,000. Watling said that the house-income ratio in Shenzhen is now running at 70 times, compared to around 16 times in somewhere like London. A few weeks back, Reuters/Ipsos released a fun, interactive electoral college map that allowed users to model their own expectations of how the 2016 presidential election would play out. Reuters also offered up their own scenario based on their internal polling data from all 50 states. And, as early as August 26, 2016 Reuters was predicting a landslide victory for Clinton. 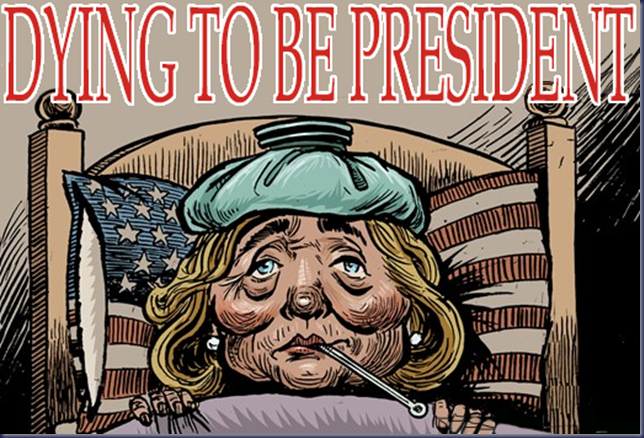 But, now it's looking increasingly likely that Reuters will have to "tweak" their polling data again as recent results show a massive Trump surge that have thrust him into the lead. Not yet having achieved a sense of direction, precious metals continued their consolidation, drifting lower into support levels. After a mid-week rally, gold traded at $1314, down $13 on the week, and silver at $19.98, unchanged. Gold’s performance sees it hugging the 55-day moving average, which is a support level in the eyes of technical analysts. This is shown in the next chart. 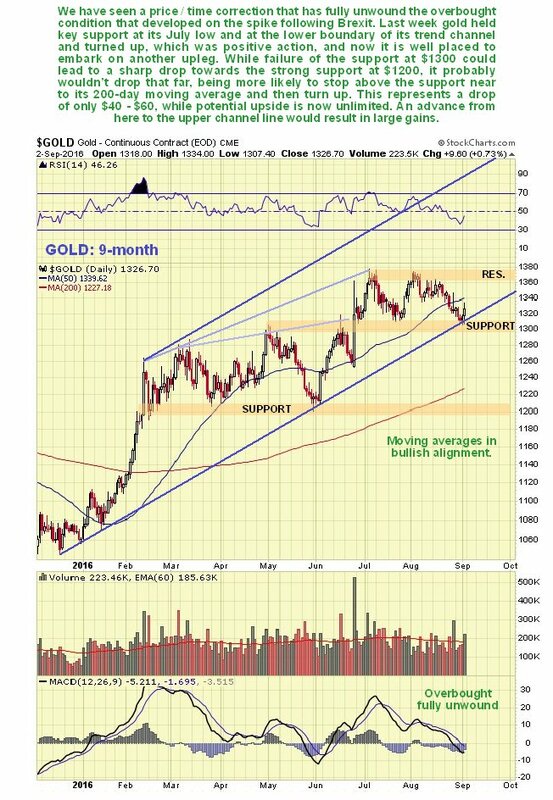 While technical traders see this level as support, they are holding back to see which way the trading range will be resolved, with a possibility the gold price might drop to the next support level at the 200-day moving average. 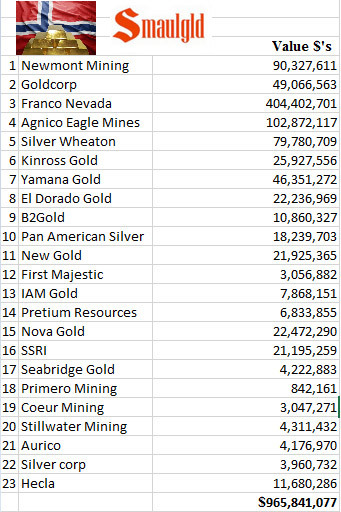 The bullion banks who are still very short on Comex will almost certainly encourage the view that gold will move down to that level. 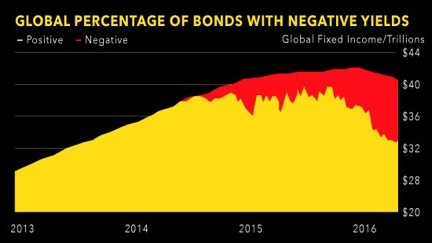 Be that as it may, there has been a substantial and upsetting fall in Japanese Government bonds, inducing volatility into bonds and equities generally. The VIX, a measure of equity volatility based on the S&P 500 Index, rose from 13.8 last Friday to a mid-week high of 19, the highest it has been for three months. 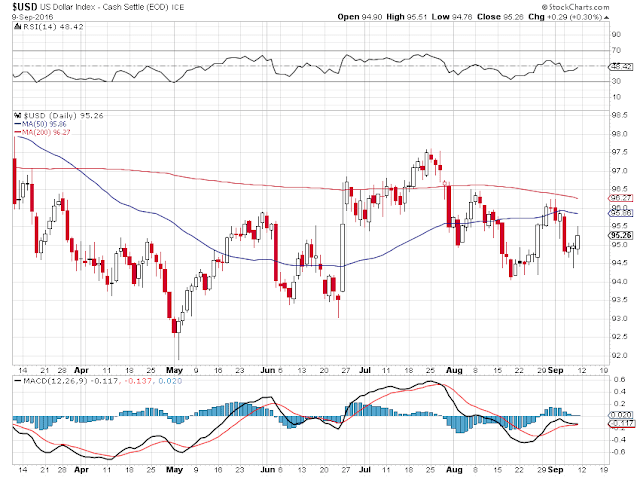 The summer period of low volatility for equities is over, with the S&P breaking lower. Traders have returned to their desks this month to find the economic and interest rate outlook is as uncertain as ever. After recent attempts to prepare the market for a September rise in the Fed Funds Rate, from various officials’ statements the Fed appears to have backed off, leaving open the possibility it will raise rates in December instead. We will know the outcome of the September meeting this coming week on 20-21 September, after which Ms Yellen will hold her quarterly news conference. Subject to next week’s FOMC meeting, it appears that interest rate uncertainty has abated for now, but economic uncertainty has increased. There is a two-way pull between deflationists and inflationists, reflected in the daily performance of the dollar. A faltering Japanese or Eurozone economy could lead to flows into the dollar, as international funds sell down the yen or euro respectively. 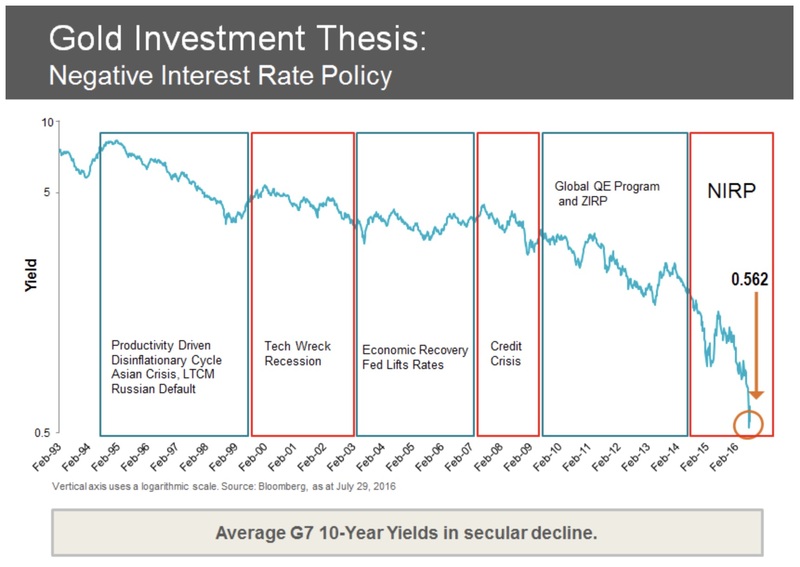 The inflationist argument is for price inflation to increase with or without an improving economy, necessitating a rise in interest rates, likely to be sufficient to break the bond market. 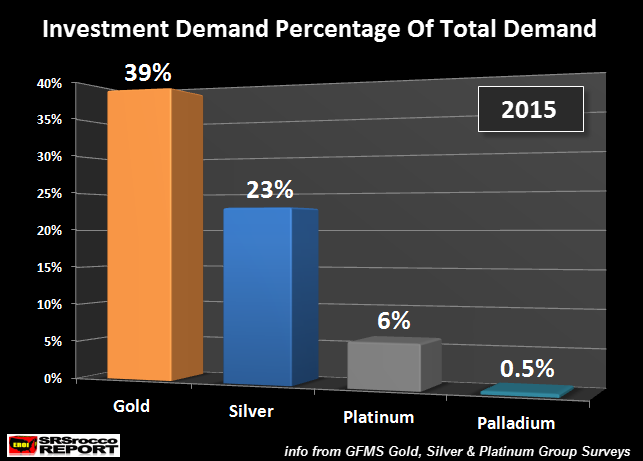 Even though bullion markets are not prepared yet to do so, we must look through these uncertainties to judge the future direction for precious metal prices. 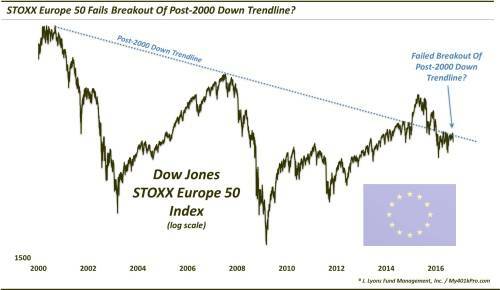 And while acknowledging the inflation risk, market instability is likely to emanate outside the US from the Eurozone. While the exact date has not yet been announced, next month there is due to be a vital referendum in Italy on constitutional reform, judged by some commentators to be as important as the Brexit referendum in the UK. The polls are neck and neck, and if it goes against the government, there will be a political crisis for Europe’s largest debtor. The EU is already in turmoil following Brexit, and an extra Italian dimension could well lead to international funds selling down the euro against the dollar. A break below EUR1.10 could trigger this outflow. 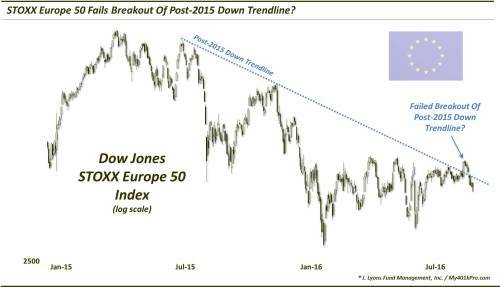 Meanwhile, domestic Eurozone investors are likely to increase their exposure to gold. 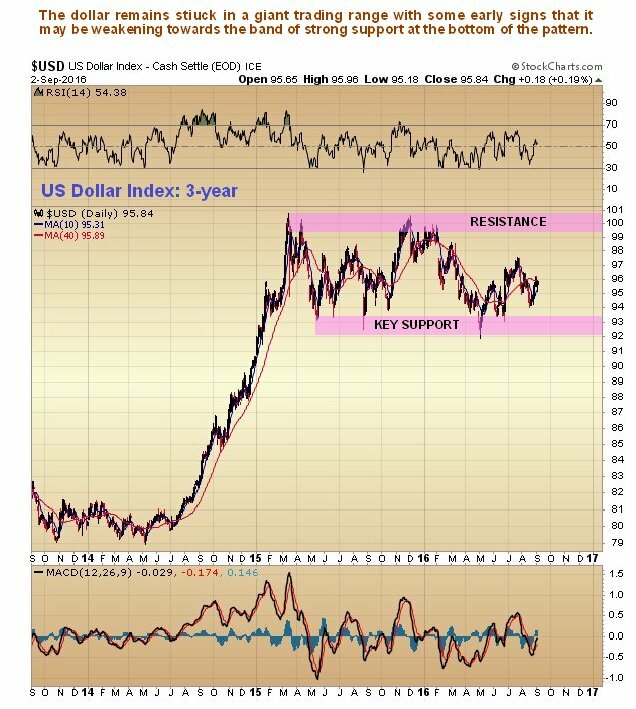 Raising the possibility that both the dollar’s trade-weighted index and gold could rise at the same time. We shall see. We discuss negative interest rates, bans on cash and the one-percenters destroying dollar stores. In the second half, Max interviews James Turk of Goldmoney.com about the basket of deplorables that is the US economy. They also discuss gold standards and Special Drawing Rights. Är dagens böter på USD 14 miljarder droppen som fick banksystemet att rinna över. Deutche bank är system bank som har derivat på långt över 50 triljoner USD och dessutom inte har pengarna att betala böterna. Hur länge till kan företagens skulder öka samtidigt som vinsterna sjunker och pengarna används till återköp av aktier. Vi är nog nära slutet nu. "This is stagflation: the Fed is increasingly f#*ked," exclaimed one veteran trader as Core CPI - among The Fed's favorite inflation indicators after PCE - surged to +2.3% YoY, the highest since Sept 2008. 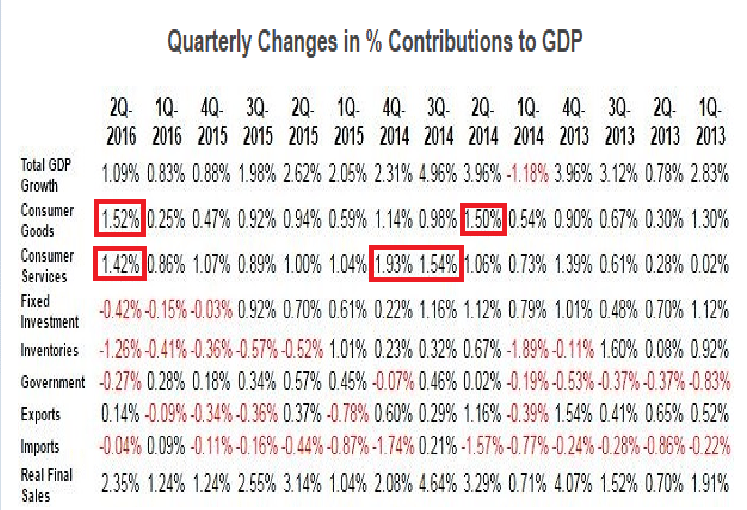 This is the 10th month in a row above the Fed's mandated 2% 'stable' growth as shelter and healthcare costs continue to surge. Core CPI growth above Fed mandate for 10th month in a row. 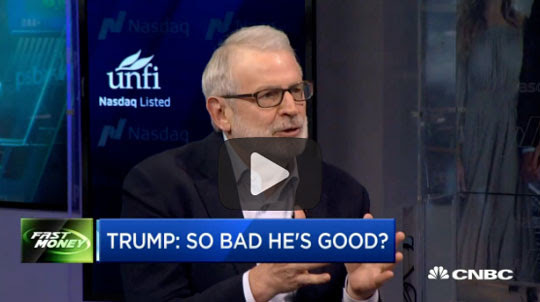 David Stockman, former OMB director, discusses why he thinks chaos caused by a Donald Trump presidency would be good for the economy. Centralbankerna stimulerar mer än någonsin och företagen har rekordskulder ändå lyfter inte tillväxten. Having warned that retail sales could be weak (based on BofA's credit card data), year-over-year growth in retail sales rose just 1.9% (its weakest since March's plunge) and worryingly in historical recession territory. MoM data was disappointing across the entire spectrum with actual contractions versus expectations of gains (Core -0.1% vs +0.3% exp, and Control -0.1% vs +0.4% exp). While clothing and food services saw spending increase, a drop in gasoline spending along with a tumble in 'retailers' down 2.4% MoM and sporting goods weighed the overall index down. Inflation targeting isn't working. Below is a chart of market-based long-term inflation expectations for the U.S. and Eurozone (EZ). 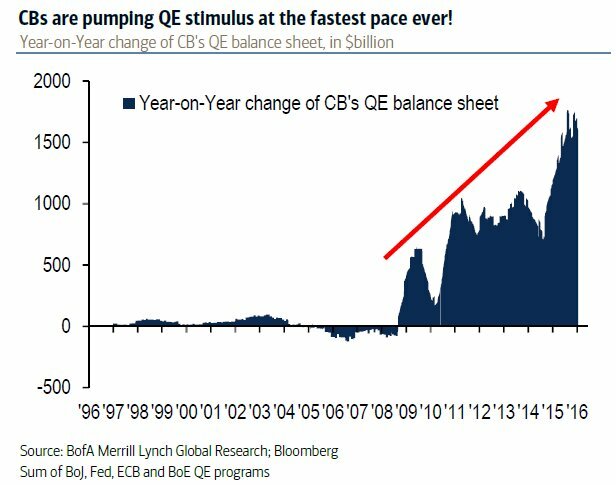 If we are not mistaken, Draghi shutters when he sees long-term inflation expectations sagging; we believe former Fed Chair Bernanke would have long been tempted to resume quantitative easing (QE) looking at this chart. 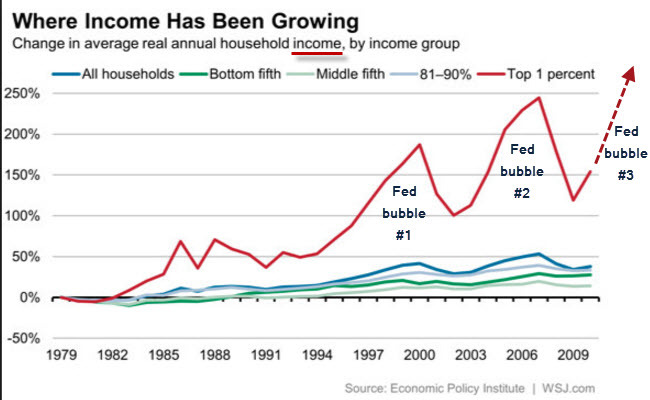 Fed Chair Yellen is a labor economist, so she may not be quite as glued on this particular chart. The Fed, in general, also likes to point out that there are other (survey based) measures of inflation that don't paint that bleak a picture. Konsumenterna håller BNP uppe i USA men vi ser en avmattning framför allt när det gäller köp av service. Vi kan inte vara närmare en recession i USA än var vi är just nu. Commercial ökar nu åter sina kortningar i guld och för att hålla tillbaka priset. Here's the 9-year chart for the silver COT Report - and it's ugly in the extreme, as this past week's changes takes the Commercial net short position closer to its old high. Here's the 9-year COT chart for gold - and it's still at nose-bleed levels no matter how you care to interpret it - and things are much worse after this past week's deterioration. Here's Nick Laird's "Days to Cover" chart updated with yesterday's COT data for positions held at the close of COMEX trading on Tuesday. It shows the days of world production that it would take to cover the short positions of the Big 4 and Big 8 traders in each physically traded commodity on the COMEX. Max Porterfield, the CEO & President of Callinex Mines, Inc. is back to discuss the meteoric rise of zinc prices in 2016, the deteriorating global economic outlook and central banking lunacy and the reason to own tangibles like silver, gold and mining stocks amidst global monetary chaos. Thanks for joining us. 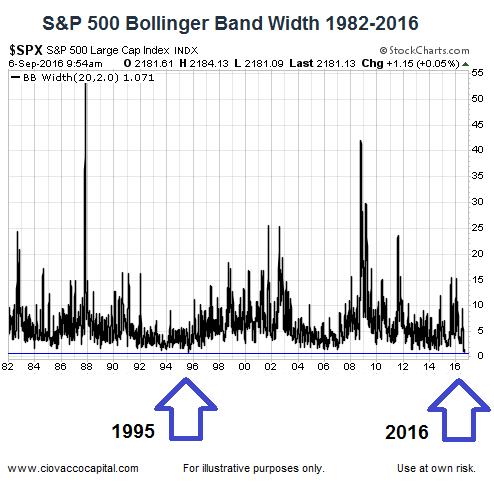 The last time Bollinger band width was as low as it is today was 1995. When volatility returned, the S&P 500 climbed 21%. Vi lever i en skuld ekonomi vilket har möjliggjorts genom lägre räntor. Vad händer nu när världen inte har några räntor och skuldsättningen är mättad. Behövs ett nytt system som möjliggör tillväxt utan att skulderna behöver öka. Innan CB har insett det så har dom tryckt så mycket pengar så värdet har blivit lika med noll. FEDs egen indikator för arbetsmarknaden fortsätter att gå kräftgång. Svårt att höja räntan när allt går åt fel håll. 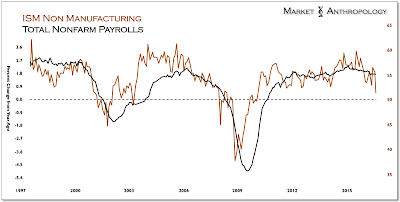 For the 7th month of the last 8, The Fed's Labor Market Indicator has dropped. ECB trycker pengar och tror att ekonomin inom EU skall ta fart. The chart below shows that a classic flat wave has panned out and is now either ended or very close to it. Hur länge till kan vi ha en värld där vi måste betala för att ha pengarna på banken. 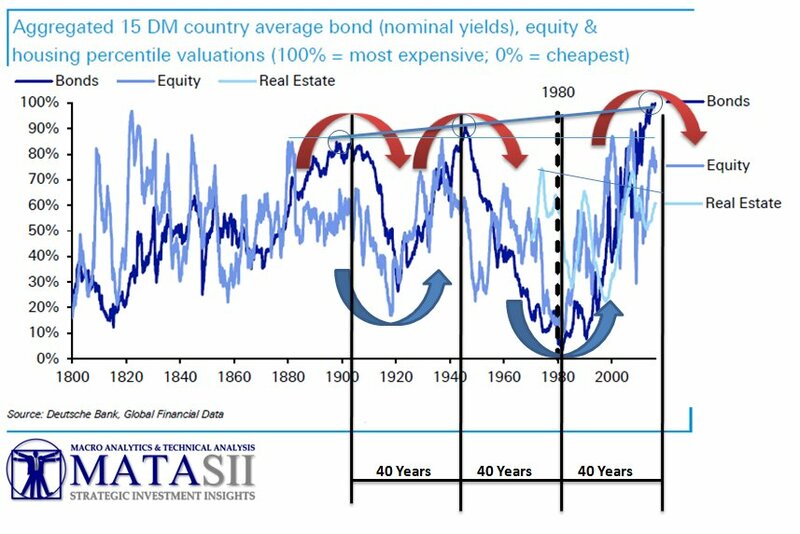 Kan vi vänta oss ett större fall om S&P 500 bryter igenom 2160?????? Hushållens förmögenhets utvecklingen är ohållbar och vi är nu mycket nära en återgång till den långsiktiga trendlinjen. Fallet kommer att bli mycket kännbart då det krävs ett förmögenhets tapp å ca 30%. 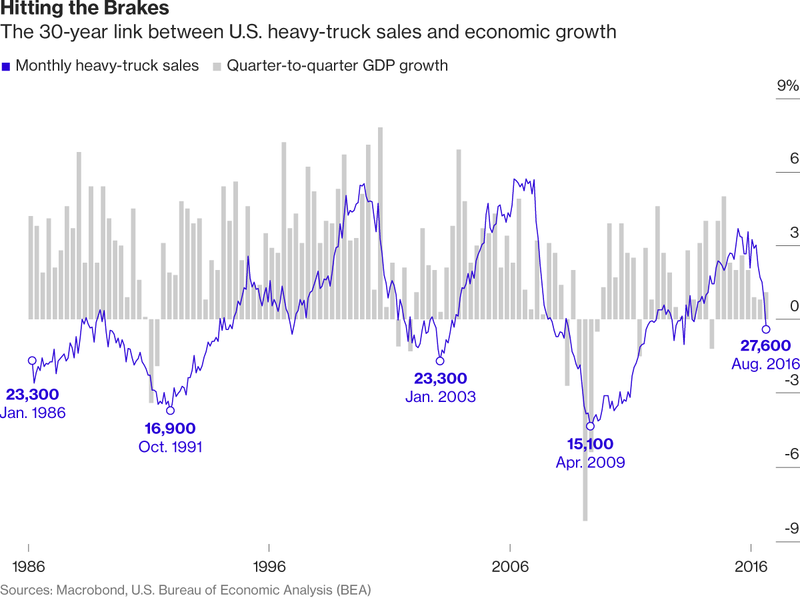 “The Fed’s monetary policy has contributed to this problem. First, by keeping the federal funds rate below its own estimates of the normal or natural rate for much of this time and way below the normal rate for nearly a decade. The second, by unnecessarily purchasing a massive amount of government and mortgage-back securities, which Fed Chair Yellen and her colleagues are reluctant to sell. I don’t see the Fed doing anything different anytime soon. Dags att köpa guld aktier. 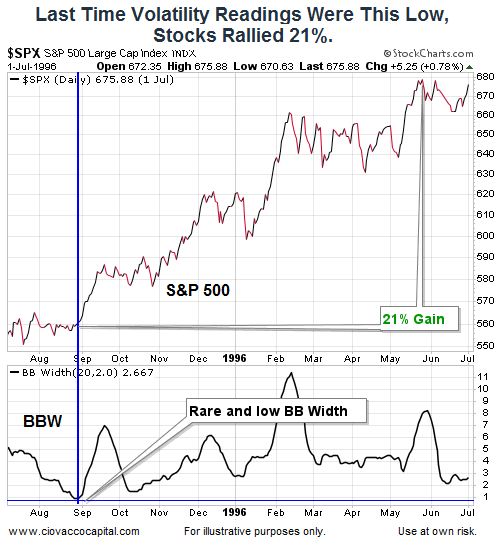 Over the past 45 years there have been 7 bull cycles and 7 bear cycles with varying duration and percentage gains. 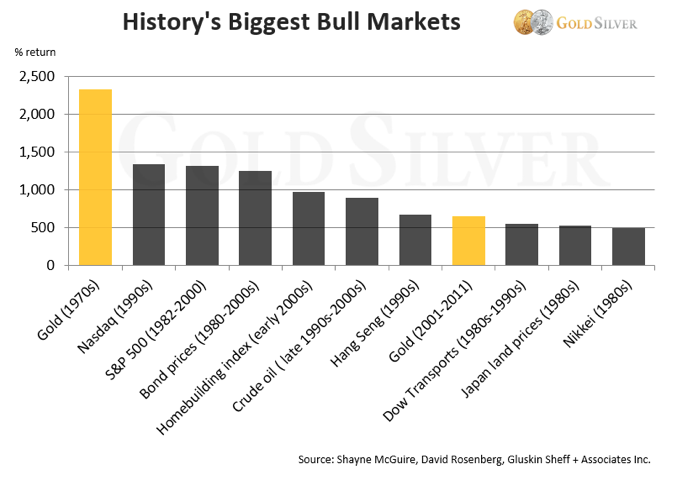 On average, from the bottom of a bear market to the top of the bull market cycle, gold equities have risen approximately 500%. Better bull cycles have yielded returns of up to 760%. No bear market was as horrific as the one just experienced from October 2012 until mid-December 2015. 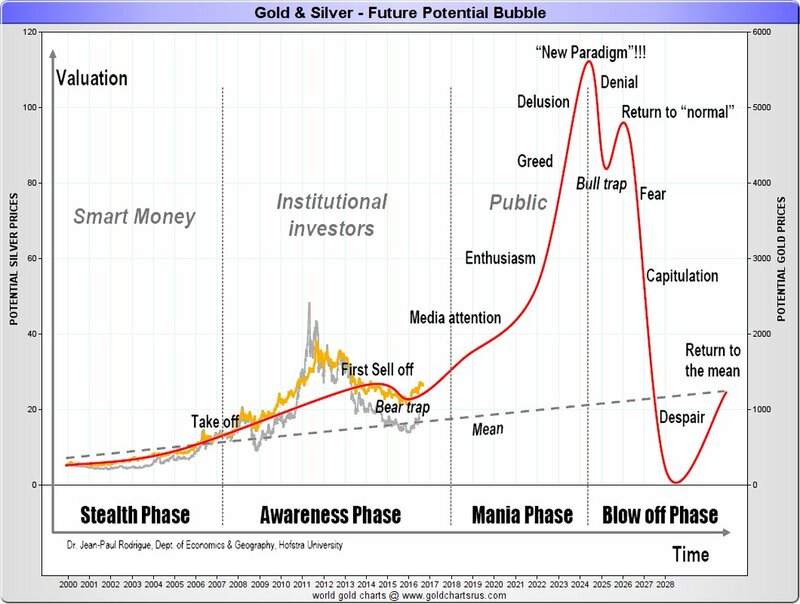 Does that mean that the new gold market we are currently in will last longer and provide opportunity for even stronger gains than those experienced in previous bull cycles? Only time will tell. Mera skulder hjälper inte för att skapa mera tillväxt. Dags för ett nytt monetärt system. 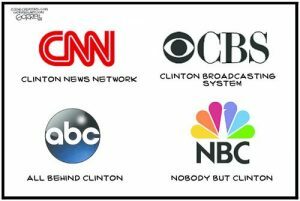 The chart below shows the common-sense truth. 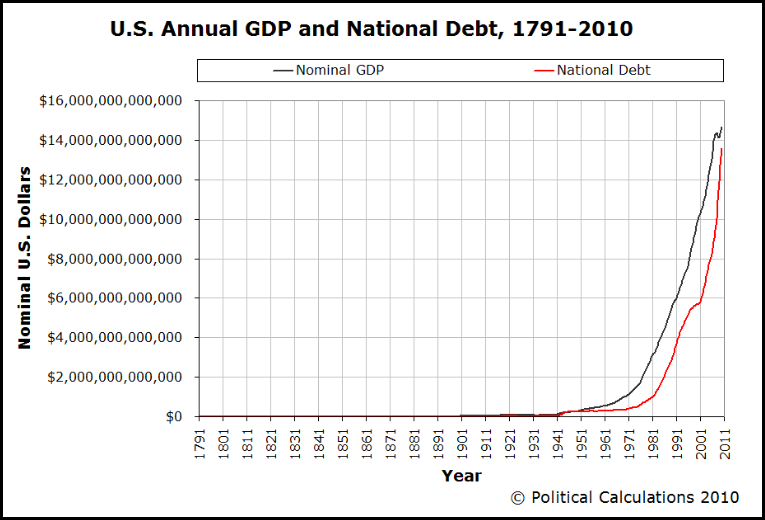 As with any drug – and debt is a financially enhancing drug – it takes more and more to create less and less of an effect. Eventually, you reach the “zero point” where there is no effect and the drug kills you from its very strain and toxicity. Finns inte mycket förtroende kvar bland de färgade i USA. Om FED höjer räntan så är nog allt förtroende borta. While consumer comfort among black Americans is more volatile than among white Americans, Bloomberg's confidence survey points to a massive collapse in comfort for black Americans last week (from an exuberant 47.9 to a dismal 37.7). This is the biggest percentage drop since Obama's Syria "red line" in Aug 2012 and biggest absolute drop since Feb 2001. Upp och nedvända världen. Man handlar aktier för utdelningen och bonds för kapital vinst. According to global consulting firm Wood Mackenzie, $1.5 trillion worth of oil projects in North America need $50 oil to make money. The price of oil has averaged just $42 a barrel over the last year. När skall FED och övriga CB förstå att dom är på fel väg. A declining money supply typically indicates deflation because there is less money to be spent, which causes prices to fall. 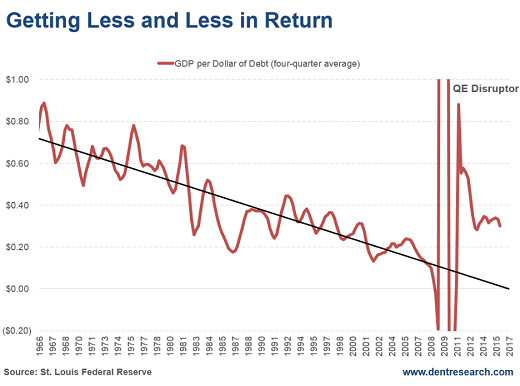 But despite all of the quantitative easing, money printing and deficit spending, the velocity of money has been declining steadily since the credit crisis. The gravitational pull is truly strong if the U.S. Federal Reserve is printing money at record levels and yet the velocity of money is declining. 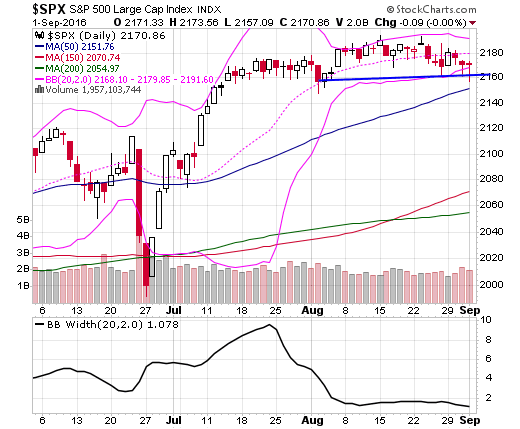 Does the stock market reflect the economy? The stock market is making all-time highs. But where is the celebration? Where are the Dow 18,000 hats on CNBC? 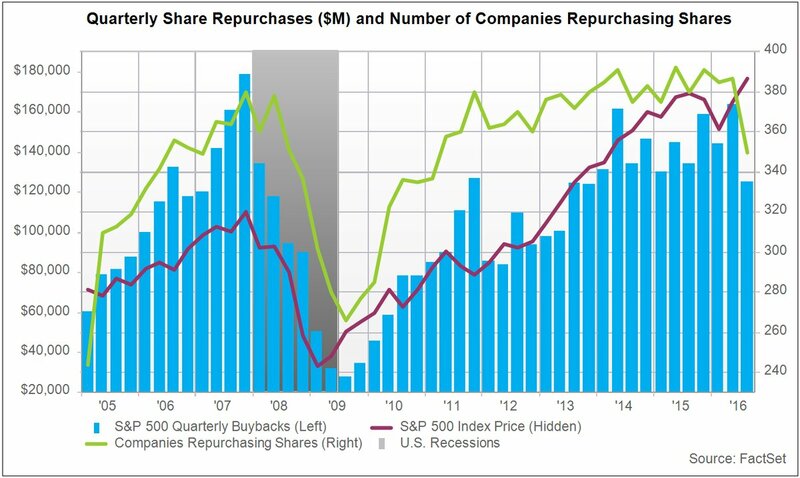 The stock market used to reflect the health and strength of the economy, but this may also be distorted by an impending investment black hole. 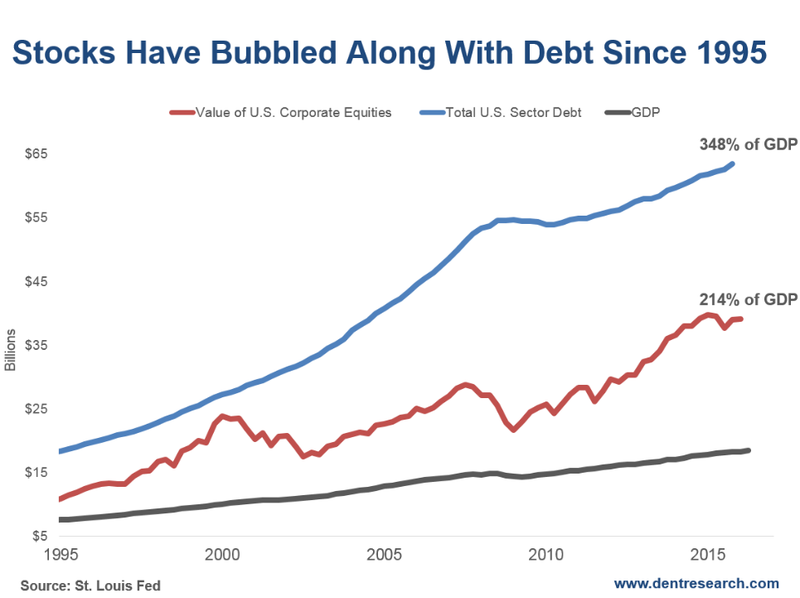 Stocks are going up at a record pace, earning investors more than 17% per year since the credit crisis, well above the 10% historical average. 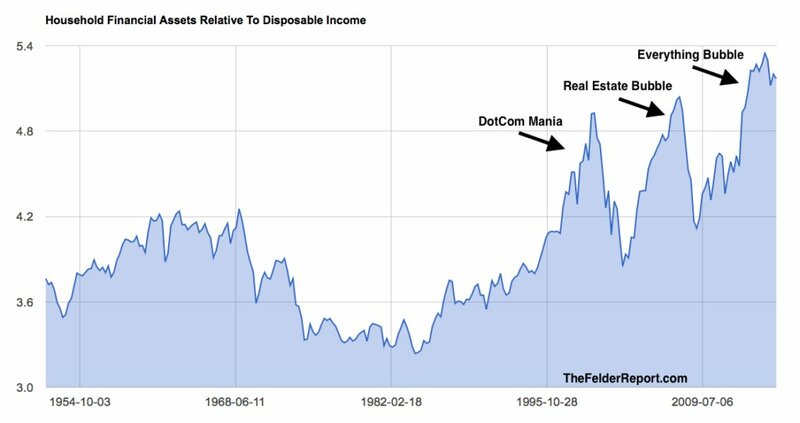 This is largely due to investors buying stocks for their dividend and the lack of other attractive options in the low interest rate environment. 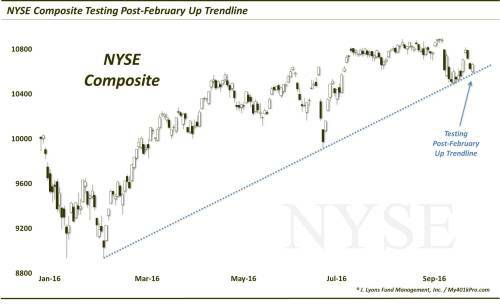 With so many investors going all-in on equities, it is no wonder most are a little uneasy with the new highs. 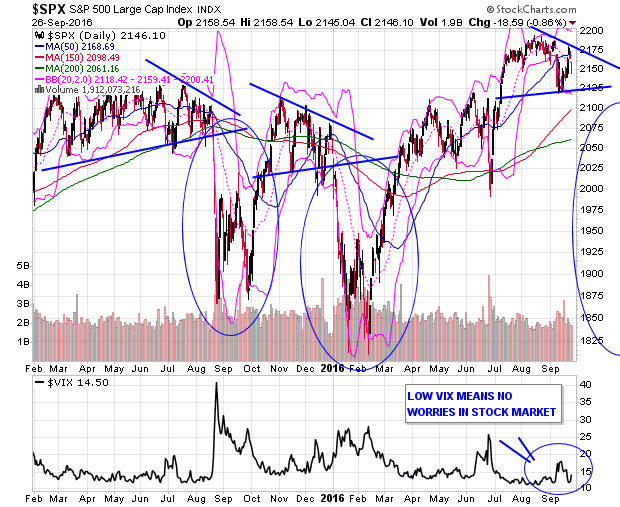 A place where the stock market is at all-time highs, bond yields are at record lows and no one is happy? That’s as close to an economic black hole as the market has seen in decades.